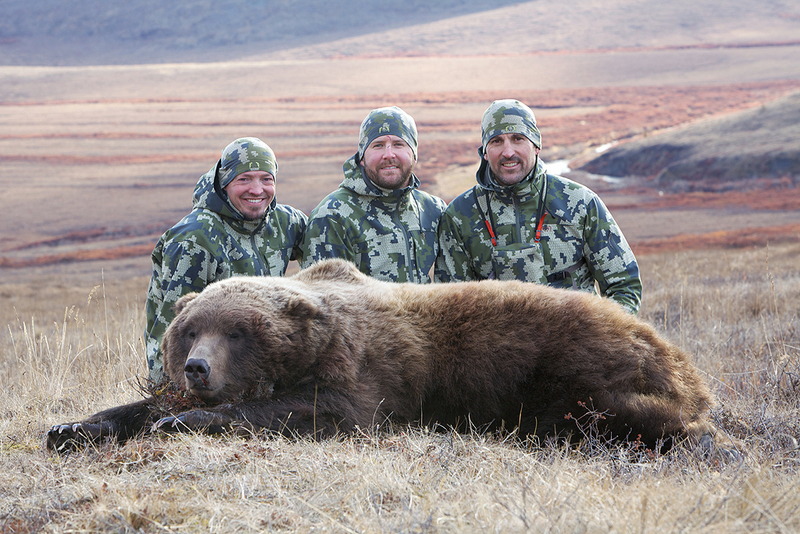 I just returned from an Alaska Grizzly hunt with Lance Kronberger the owner of FREELANCE OUTDOOR ADVENTURES. Lance is a great friend, father and husband. 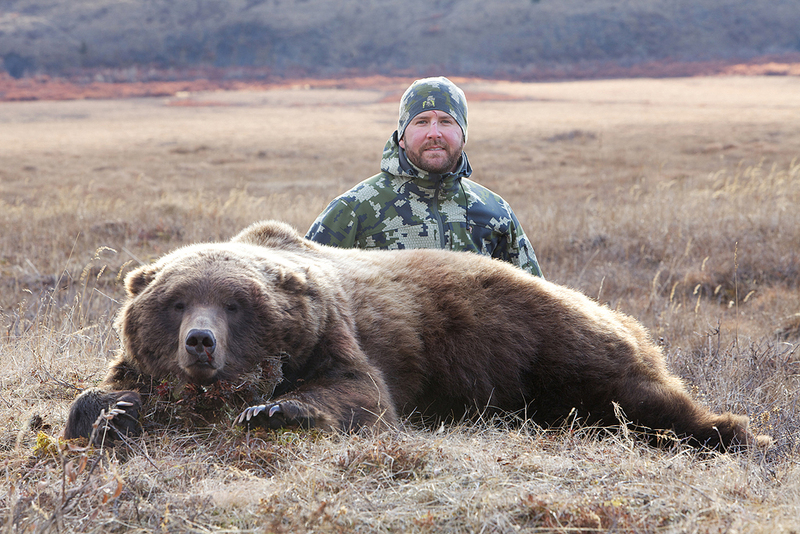 He and his lovely wife Nikki, run a fantastic operation for Brown Bears at Cinder River Lodge, Dall Sheep in the TOK and 14C and Spring and Fall Grizzly Bear Hunts out of Unalakleet. Lance is an absolutely amazing guide with endless amounts of positive energy and attitude. His organization and attention to the smallest details make his trips run incredibly efficient and smooth. I am already looking forward to my next hunt with Lance. It was great to finally hunt together! I hope you enjoy the enclosed photo essay. The hunt started in Unalakeet, where D.J. Trahan, Paul Bride and I met Lance at the airport Saturday afternoon. We organized gear, changed into our hunting clothes, loaded our packs and gear into Jim Tweeto’s Cessna 180 and flew into the headwaters of Bear River. 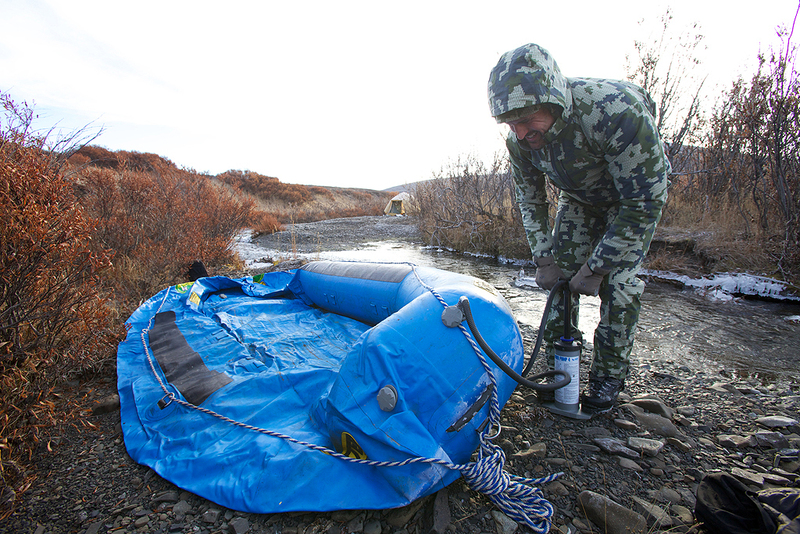 We air dropped an NRS 12 Foot Otter raft, food and gear five miles down the river from the landing strip where the river was wide and deep enough to float the raft and gear. 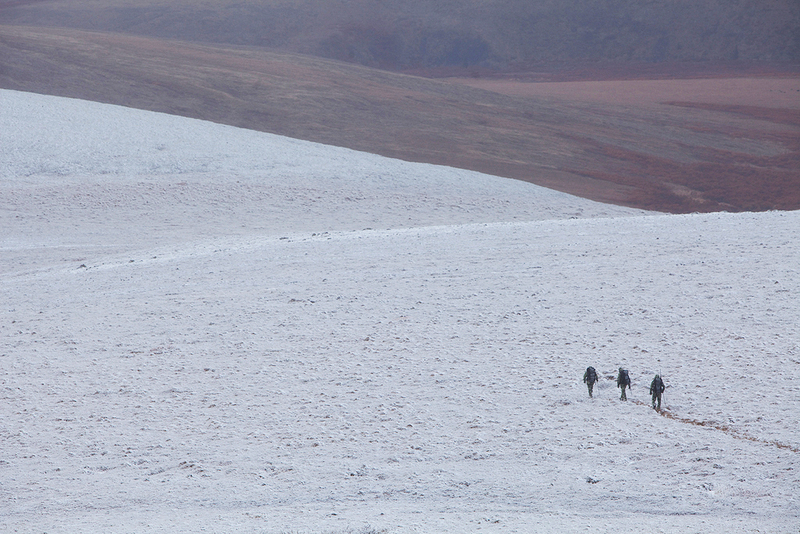 We landed on a high ridge where we set camp for the night. 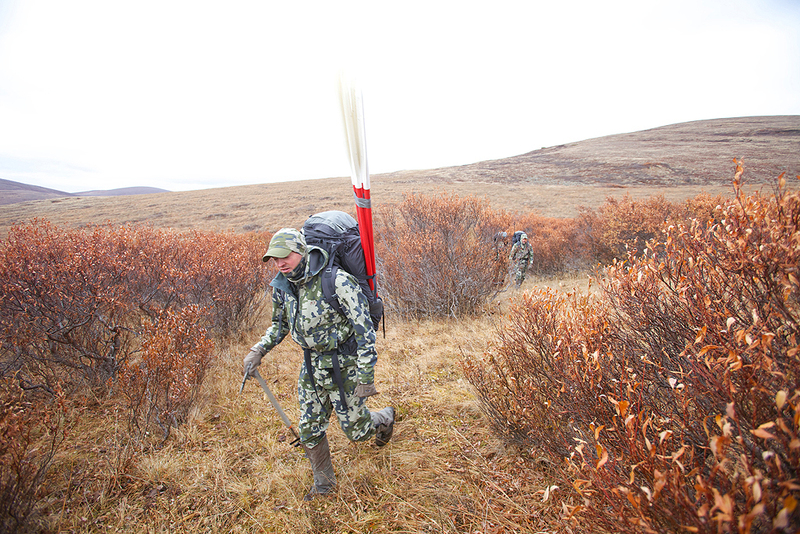 Lance spotted the 1st Grizzly from the airstrip shortly after we set up the tent. A beautiful blond boar in the 8 -foot range. 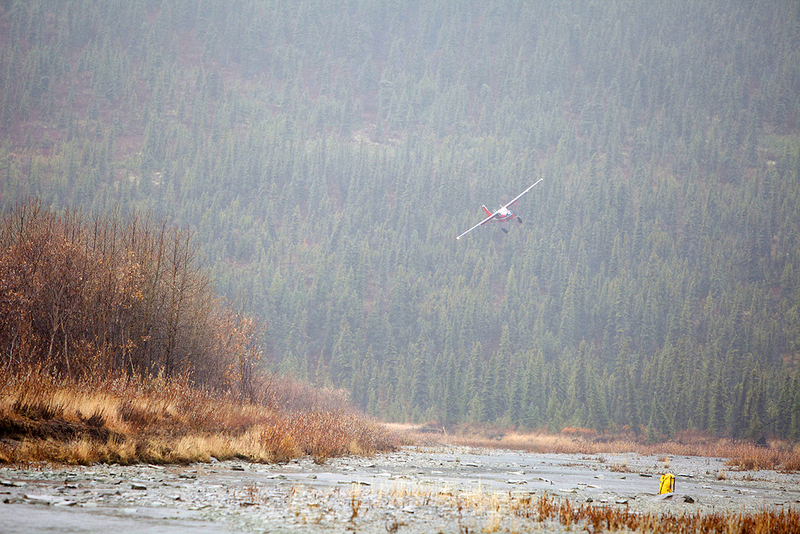 You cannot hunt the same day you fly in Alaska, all we could do was watch this bear feed into the drainage below camp. It was certainly an exciting start. D.J. plays golf on the PGA tour and has a tournament in Las Vegas that begins on Thursday. He would really like to play if we can get him a bear in the first couple of days. With this in mind, we hunted from the strip the 1st morning. It was 15 degrees and everything was frozen in and out of the tent when we woke up. After a quick breakfast and coffee, we headed to a high vantage point to glass. 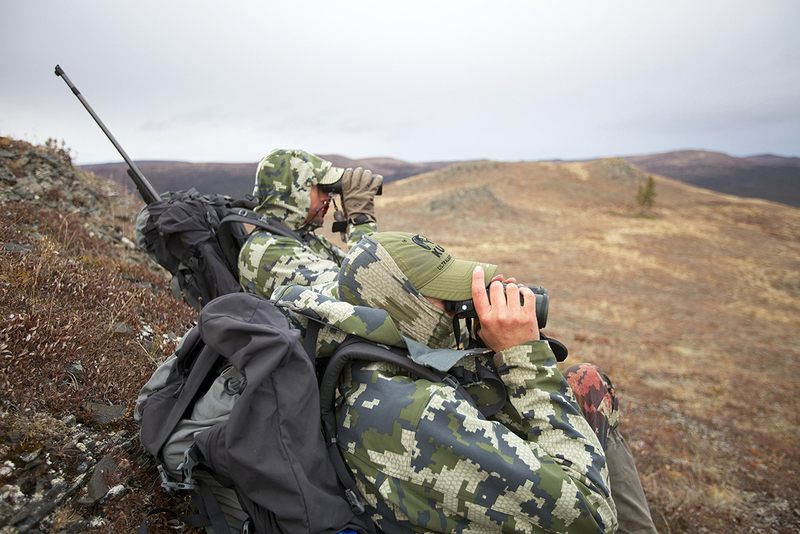 Lance quickly spotted a bear digging on a far ridge. Fog on the far ridge made it hard to tell the size of the bear. Without being able to get a good look we let him feed over the ridge. 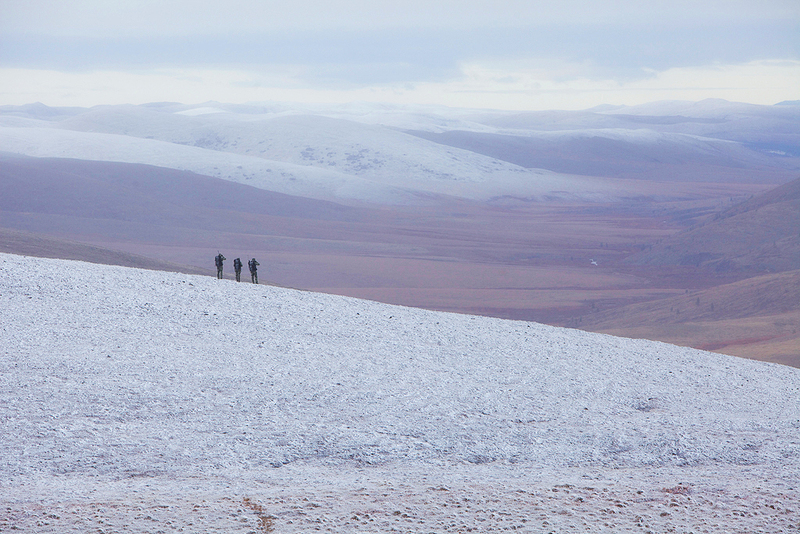 We dropped down to a new vantage point and Lance spotted a Sow and two cubs on a distant ridge. 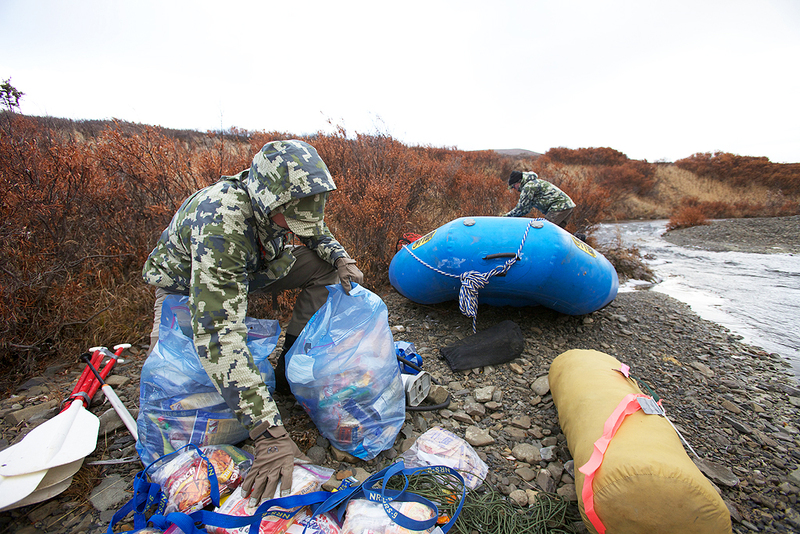 We hiked back to camp to have lunch and break down camp and backpack it down to the airdrop on the Bear River. On the way back to camp we ran into a heard of Musk-ox. They are fascinating animals, truly adapted to survive in the harsh northern cold that comes off of the Bearing Sea. Heading to the air drop. About an hour into the hike down to the river we came up on a large hummock filled grass flat. We had the wind in our face and we were all busy picking our way across the top each hummock so you do not twist your ankle or knee. I looked up and saw what I first thought was another Musk-ox, but it did not have the long hair or horns. Finally it registered, a Grizzly, crossing the flat 200 yards above us. I look ahead and Lance and D.J. had not seen the bear. I tell Paul to get down and look back at Lance and he is getting D.J.’s gun out of his pack. I drop my Icon and do the same. It must be a big bear! I run up 10 yards to a large hummock and throw down my pack and my .300 over the top of it and put the cross hairs on the bear to back up D.J. I hear D.J.’s gun go off and the bear does not act hit. I wait with my cross hairs on his front shoulder. The bear continues across the flat looking at us. After what seemed like an eternity, but was probably only 30 seconds D.J.’s gun goes off again. The big bear drops and begins to get up, I shoot and hit the bear and he goes down again and tries to get up and D.J. puts him down for good. I run up to Lance and D.J. 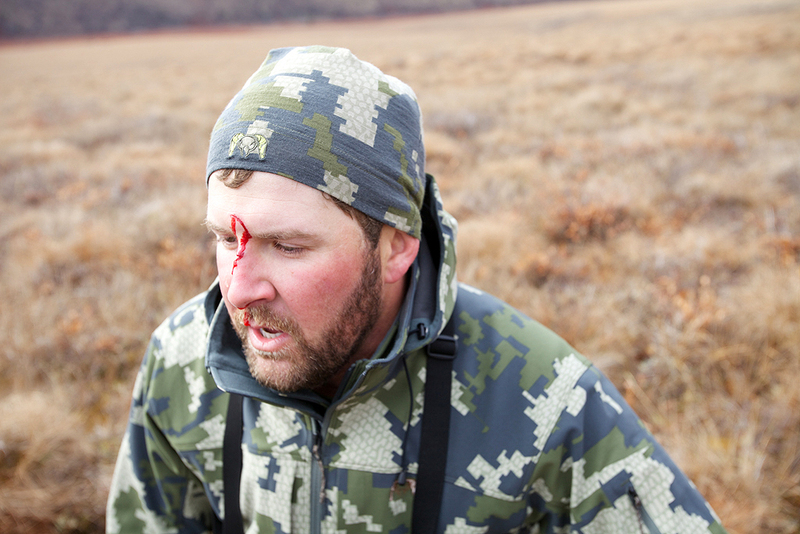 He is bleeding from his forehead, scoped from the 1st shot. 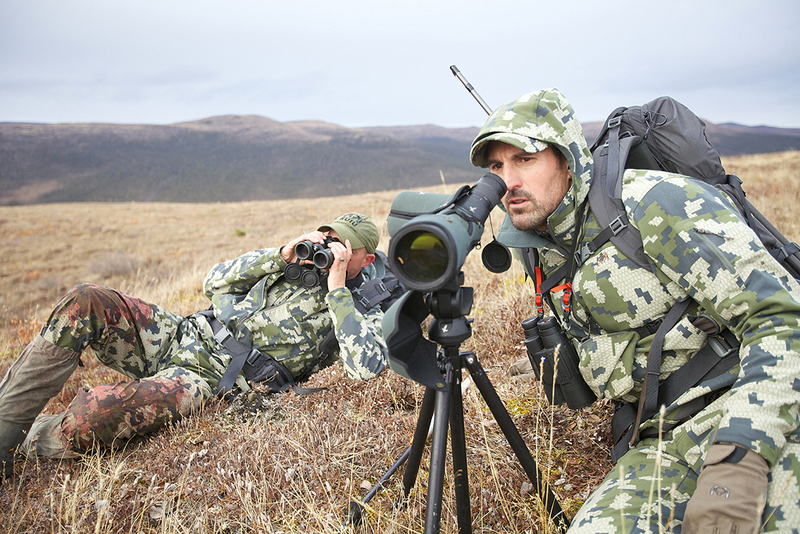 He could not get the gun solid on his shoulder and was worried the bear was going to run and he rushed his shot putting the scope into his forehead. 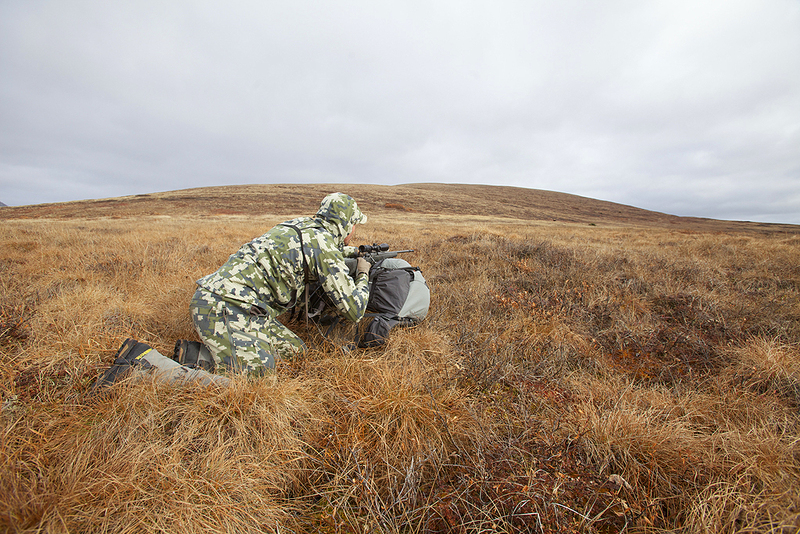 After the stars cleared he was able to anchor the gun on his shoulder and get his first shot into the bear. 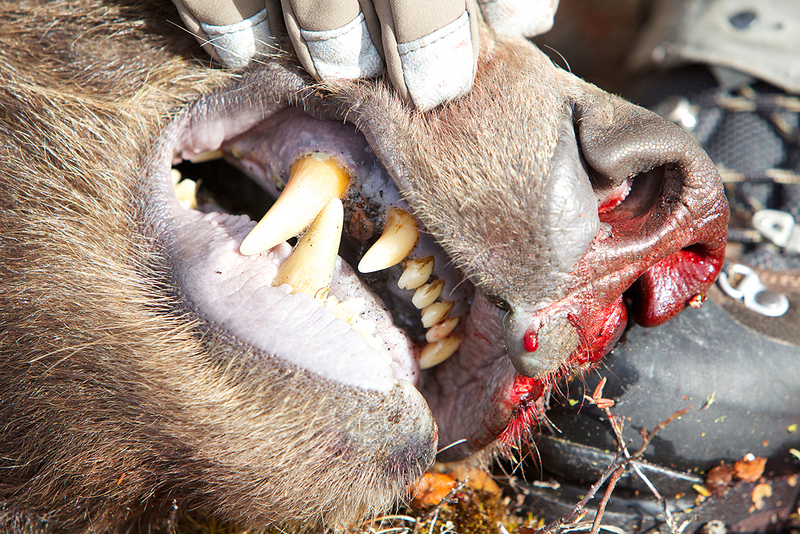 D.J.’s bear is an 8-foot, 22 ½” healthy boar with an absolutely beautiful hide. We were all thrilled for him. We spent the night on a gravel bar on the Bear River. Lance and D.J. 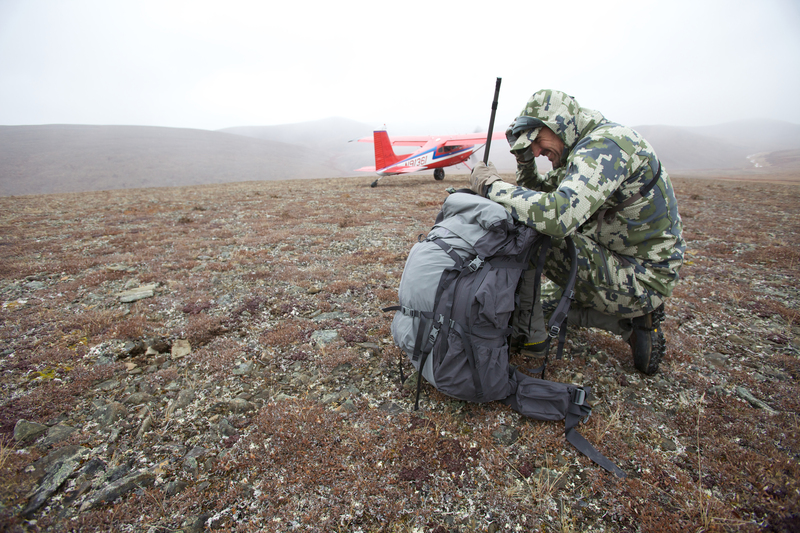 took the bear hide and his gear back up to the landing strip to be picked up by Jim. Lance was back by noon. 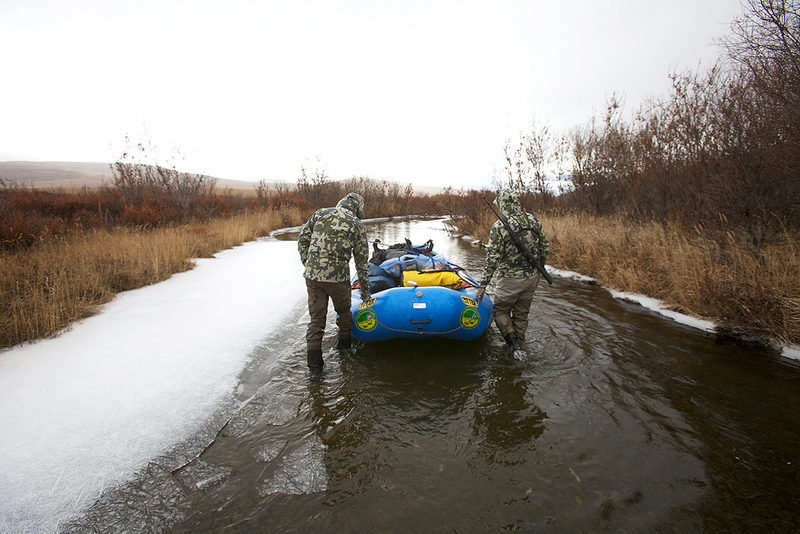 We loaded the raft and began a 2-day walk down the river that was floating ice. We spotted a sow and two cubs right before dark above our camp. We ate our Mountain House and climbed into our bags. It is dark at 8:30pm and does not get light enough to see until 8:30am. It is a long night of sleep. We are up at 8:30 and cross the river and to glass. 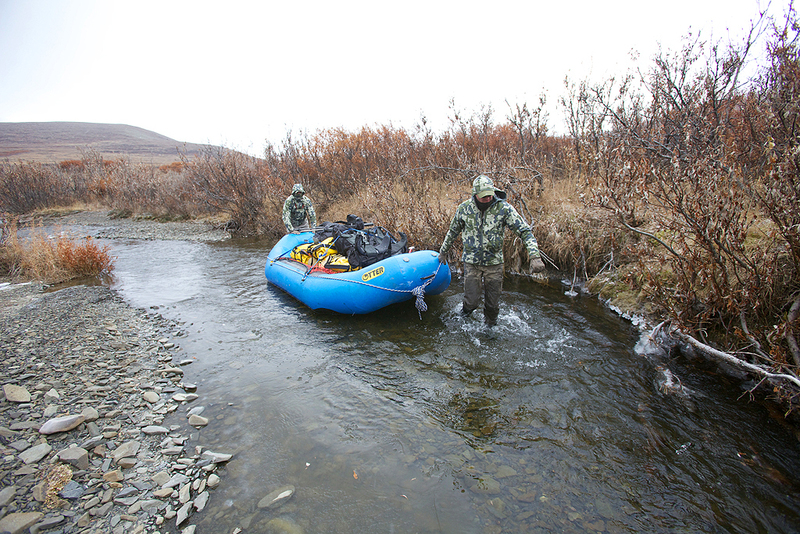 No bears are spotted so we load the raft and continue to push the raft down the river. This continues all day. The river grows with every tributary we pass. It is almost floatable by the end of the day. We climb up onto a high outcropping above the river to glass. We spot another sow and two cubs and a bull moose at the far end of the drainage. The fall colors are stunning, coppers, reds, chrisom, tans, with contrasting white lichen and snow peaks make the landscapes breathtaking. 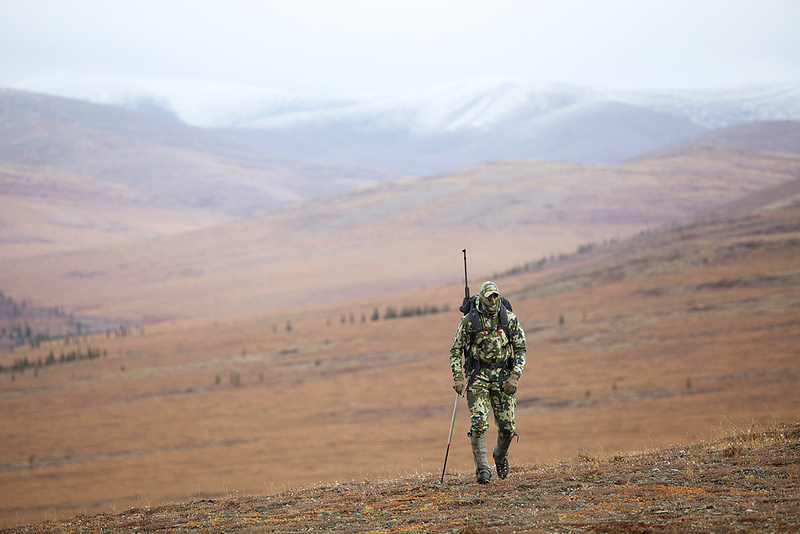 The country is vast, large and gives you a feeling of remoteness like nothing I have felt before on a hunt. The river is now deep enough to begin floating tomorrow. We make camp on another gravel bar. The wind begins to blow, the weather feels like it is changing. It is cold and windy. The wind is bad. It is at our backs as we begin to paddle down the bear at 9am. We begin to see Silver Salmon and trail form along the river from Bears fishing. 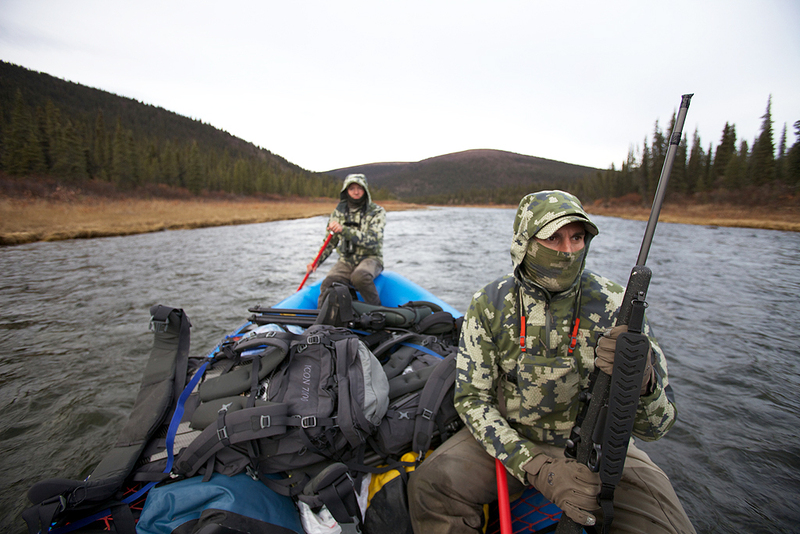 The bear hunting will continue to get better the further we float. 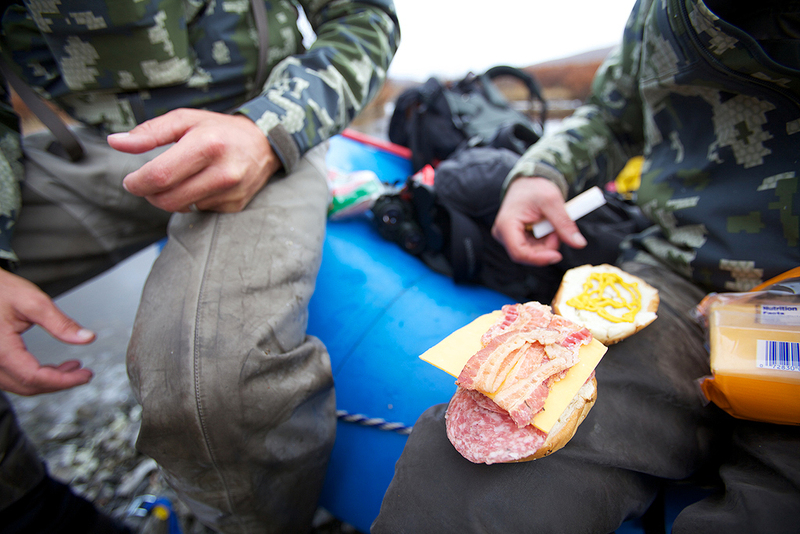 We have our daily lunch of a bagel with mustard, Cheddar Cheese and Dry Salami, chips and a candy bar at 1:30pm. We are on the river again at 2pm. Lance is out of the boat holding us at a stop in the middle of the river. A giant Boar is walking up the left bank at 400 yards and closing the distance. The wind is still bad, really bad, right at our backs. 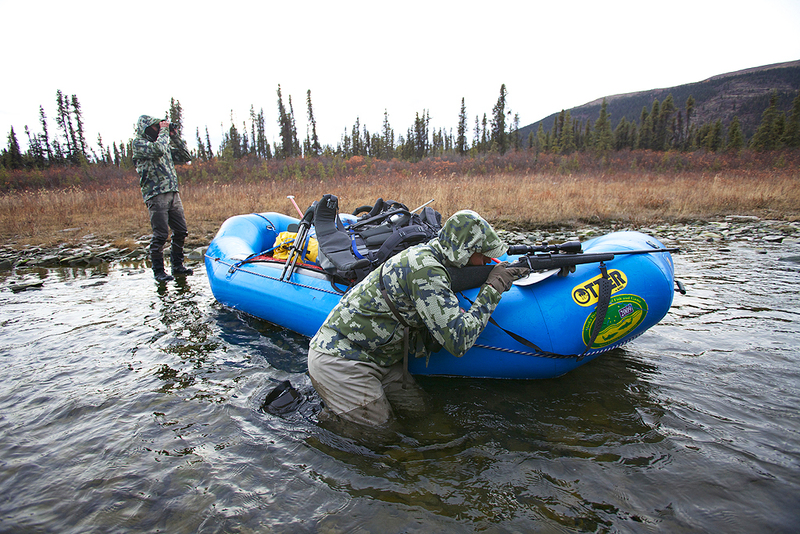 Paul and Lance pull the raft sideway’s I drop a shell into my gun and quickly close the bolt while moving around the boat to get set up for the shot. “350 yards” “SHOOT NOW HE SMELLS US” Lance whispers in my ear. The big bear’s head is in the air as I settle the scope on him. In a flash he is up the bank and gone. No shot. I can see the disappointment on Lance’s face. My adrenaline was maxed! It all happened so fast from the chance at a book bear to only memories in a flash. After paddling down stream for an hour in disappointment, Lance spots another bear on a distant open ridge on the skyline. It is a Boar and big. The disappointment quickly goes away, the focus is this new bear. 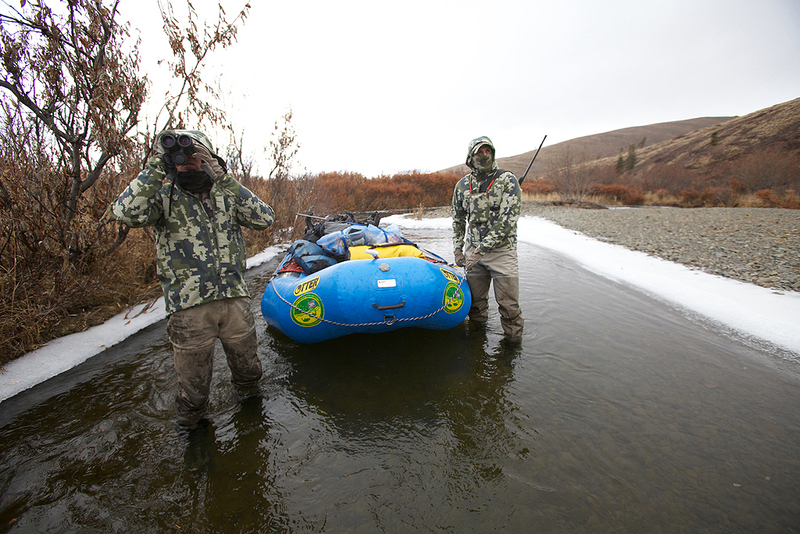 Dealing with the wind and position, we are optimistic we can paddle the river around and downwind of this bear. As we parallel the bear on the ridge 1000 yards above us, Lance is concerned. The bear is checking the wind hard. We keep paddling. 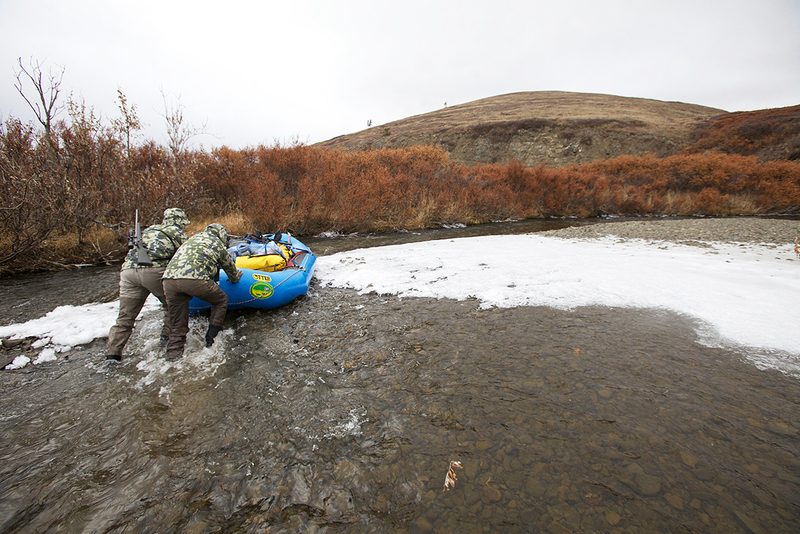 We beach the boat, get out of our waders, and head up to the top ridge. The bear is gone from the grassy flat. We can see where he was digging and realize the wind off the river got us again! Back in the boat paddling down stream, thirty minutes later we round a corner and there is a bear walking up the right side this time. Lance bails off the raft. I grab my rifle and we head to the left bank. The set up is perfect, finally. I get a solid rest across the front of the Otter and center my cross hairs on the bears front shoulder as he is quartering towards me at 125 yards and wait. Lance is not sure this bear is big enough to shoot. He tells me to stay on this bear he is pulling the scope out to get a closer look. Back in the raft paddling down stream again. It is getting dark and we look for a gravel bar to spend the night on. The wind is up and you can feel the weather changing by the minute. We round the corner and at 200 yards it is easy to make out a BIG bear against the yellow grass at the curve of the river. The wind is good and we quickly do our drill pulling the raft to the shore on the same side. I set up for the shot. I cannot get steady and pull the raft closer to shore to get it steady. 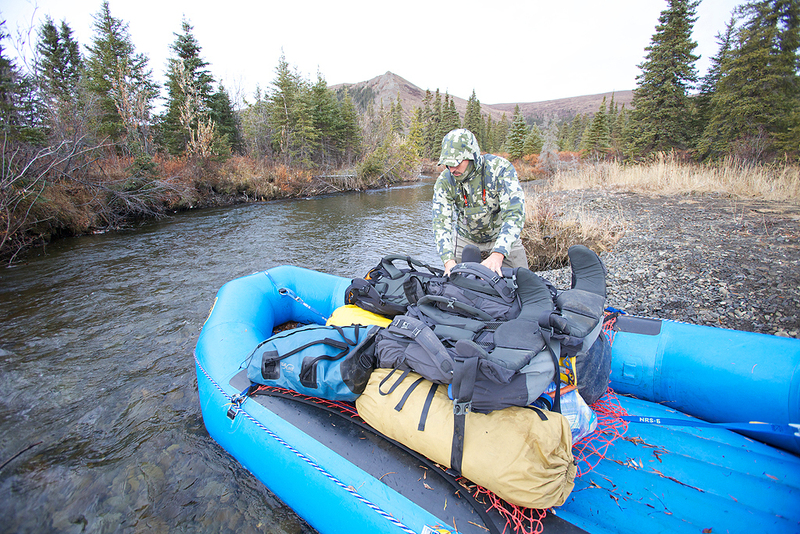 Not steady enough and I turn the raft completely sideways and move my shooting position to on top of all the gear. The big bore continues along the river bank, head on. I put my cross hairs on this chest. But his head is down as he walks towards us. No Shot. He comes to a downed log and will have to go around it on the riverside and this will give me my shot. I wait anxiously and nervously for a shot that I fear may not come. Certainly not fast enough. WAIT! What! He does the opposite and turns and heads up the bank away from the river! I have no shot due to the deadfall and he disappears in the thick brush above. We wait for him to show up again. He never shows. Crushing! I thought this was it. It is now dark as we set camp. The wind is ripping and we make sure we tie off the tent solid. It begins to rain as we climb in for the night at 9:30pm. It rains hard all night. We wake up to more wind. The rain has stopped. Lance is on the Sat Phone. The weather is Bad and going to get worse. Strong winds, heavy rain and snow is expected through Monday. 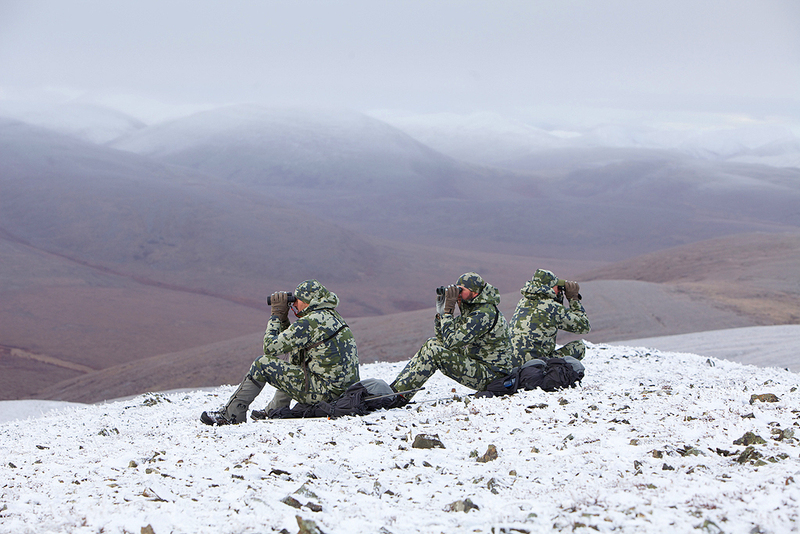 This is part of the game hunting this far north off the bearing sea in October. Mother Nature wins a lot here! We call Jim and have him get us out while we still have a chance. 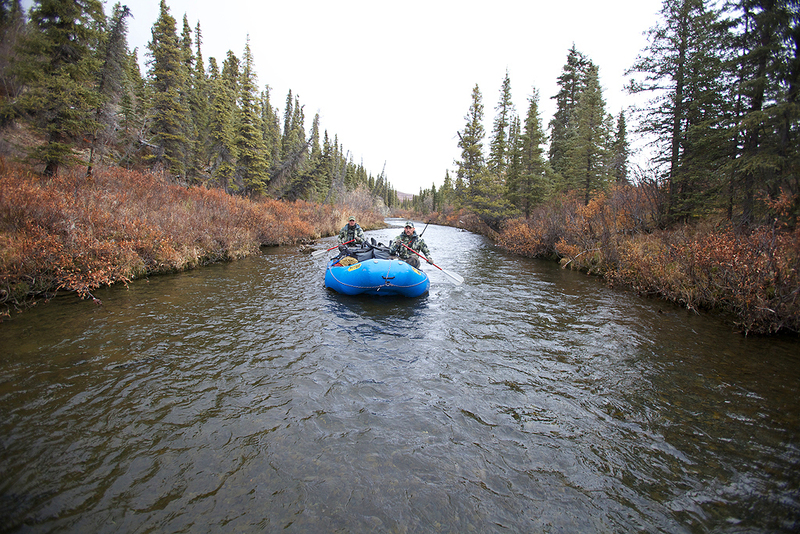 We paddle aggressively for 2 miles down stream to the last good strip for the next 20 miles. It is a good decision even though we are totally disappointed we are leaving early without a bear. The rain comes just as Jim is to come pick us up. We barely get out. Looks like quite an adventure! Thanks for sharing, Jason! Thanks Nigel! Always good to hear from you. Jim T’s plane is a Cessna 180 not a 206. Thanks I made the change. Nice read! Hey…..the green hat. When can I get one? They are on order and will be available after the 1st of the year. Sounds like a great trip. Amazing scenery! Can’t wait to hear the details of the gear used. Tough heading home without punching the tag. I’ll have to take a closer look again at the post after work. Nicely written with the pictorial Jason. Disappointing not gettin a bear but the memories will stay with you for a long time. Those bears will be bigger next time you get after them. Great point! Thank you David. How did your boots work for you? Looks like you put em through a great test! The best Mountain boot I have ever had on my feet! The full shank takes a bit to get used to, but the stiffness makes these boots perform amazing in steep terrain. They are better than I expected. Thanks for sharing. What an adventure. Excellent adventure and story telling. 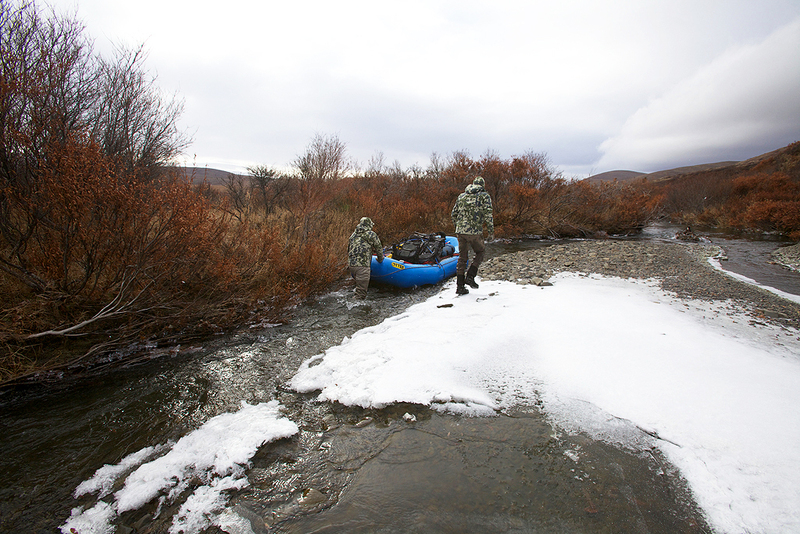 Having trudged across much tundra and tussock country, it was easy for me to put myself there on the river with you. Not-killing is part of hunting of course, and I sincerely appreciate that you tell it like a hunter sees it. Thanks. I’d like to know what you guys wore for waders and lower leg water protection…..? Thanks Kevin. Simms G-3 waders and Simms light weight wading boot. 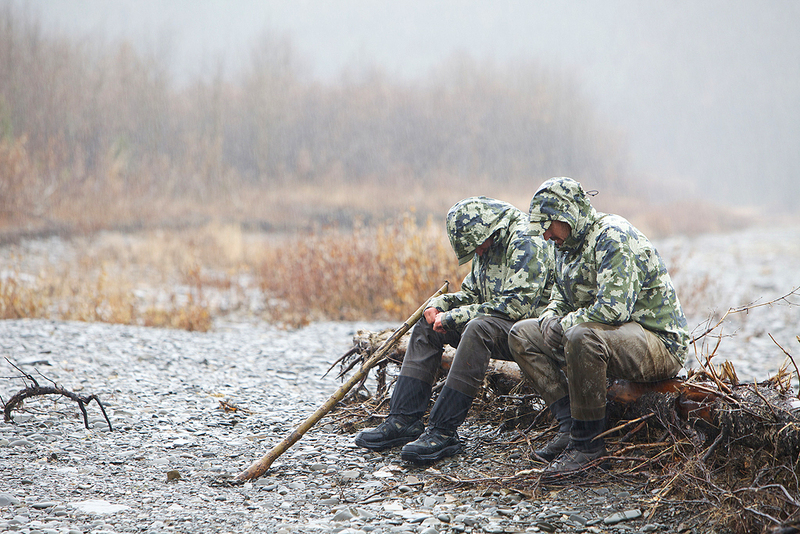 When I was not in the waders I wore KUIU Yukon Gaiters and our new Zamberlan Pamir boot. Well done on the pics and story. Very successful hunt in my books. Thanks Matt, it was a great hunt. Wow what a great story and amazing phottos to back it up. Great stuff. 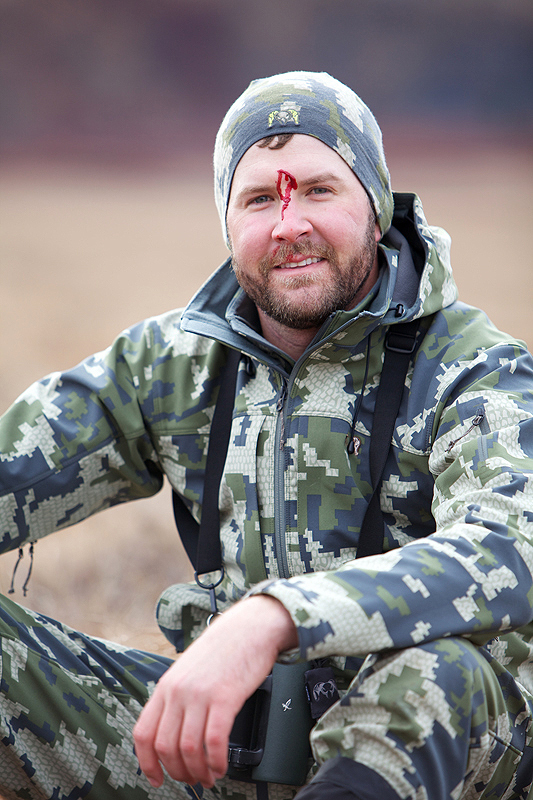 Jason can you comment on the clothing gear you are wearing on this hunt. Some of the pictures show you in full camo and others in camo top and tan bottom. When you are standing in the water, what boots are you wearing. In some pictures you are wearing gaters? It would be helpful in ordering gear to know what gear works in 15 degree weather. What layers did you were? When I refer to you I really mean the hunters in these pictures. 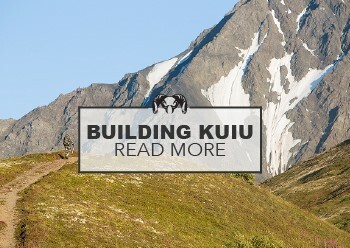 You stated before the hunt that it was a test of Kuiu gear, what worked and how was it used would be great info for us ordering Kuiu stuff. I wore the full KUIU Kit with a couple of new Prototype layers. Merino 185 a new 230 Merino Brushed Fleece Prototype, Guide Vest, Prototype Insulation Jacket and Guide Jacket, Guide Pant, Yukon Gaiters and the new Zamberlan Pamir boot. When it was 15 degrees and I was very comfortable. The Guide Gloves were the only gloves I wore the whole time. I wore Simms G-3 waders and their light weight wading boot. Let me know if you have any other questions. Good luck Bill. It is good to hear from you! Looks like a beautiful area, to hunt in. Was wondering what type of waders you were using? They look pretty comfortable. AWESOME! Beautiful country for sure. Great hunt and you guys made the right call! Plus, there is always next time! Thanks Bryan. 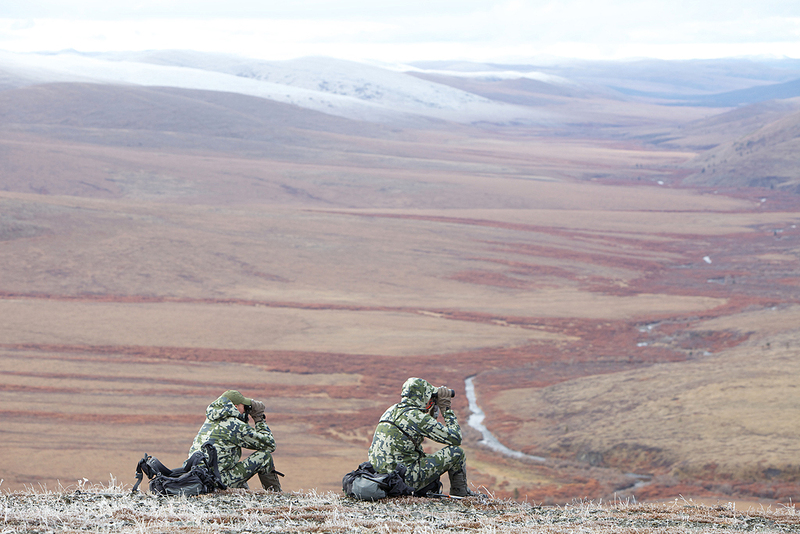 Hunting during October that far North you need to use common sense. I will be back. GREAT story! You definitely had my heard pounding in some spots. I could feel like I was there. These photoessays are awesome too! Great story and photos Jason. I felt like I was right there with you! HOWEVER, I just saw an article that said Cessna has a new facilty to assemble aicraft in Shijiazhuang, China (for real). I am dissapointed that you and Lance were not more straightforward in your story and tell us that you were using a company with facilities in China. You hid this from us. Please tell Lance that I will no longer be planning hunts with his company from now on until he uses only North American planes. Good luck in your future endeavors. LMAO! Thanks Kevin! I will let Lance know you will no longer hunt with him. That is good stuff! That’s funny stuff right there Kevin! Jason…Great adventure. 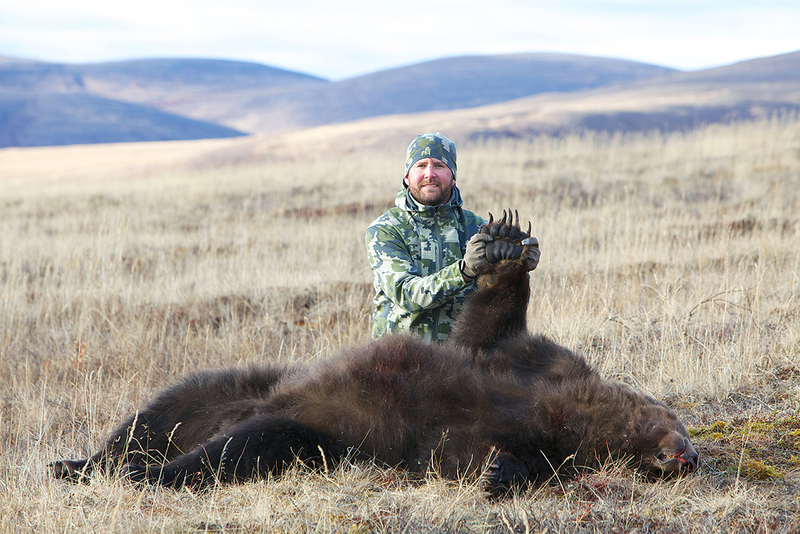 I will be doing some testing myself next August in the Brooks for Dall and Grizzly. Will be the “maiden voyage” for my newly ordered Boswell .300 WSM. I too am interested in hearing about your wader selection. Great to hear you bought a Boswell Custom .300. Steve’s rifles are worth every penny! YOu will really enjoy hunting with it. I was wearing Simms G-3 waders. Wise decision to get out on time, sorry to hear that the right opportunity didn’t appear. Although it seems like a great adventure, love it, I will need to try it. 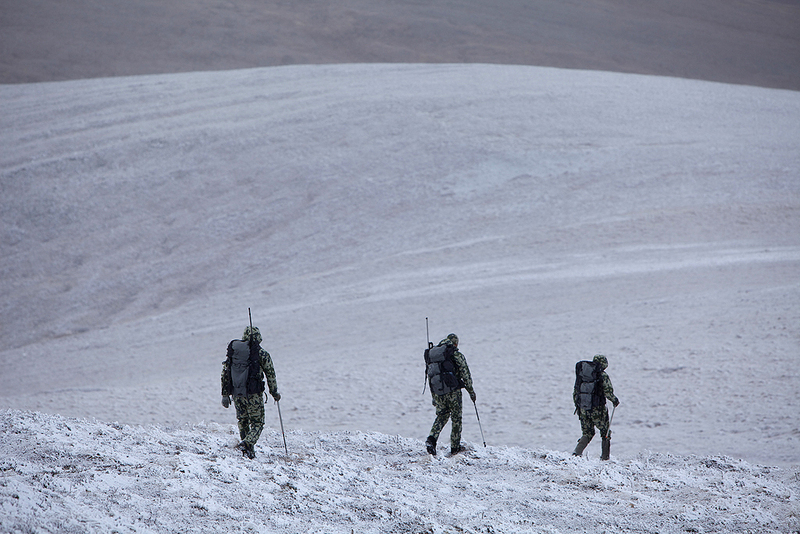 Most be tough hunting with that weather and in such a humid environment. Tell us more about the protos! I would like to ask you a favor, go on more hunts!!! Love these reports and the stories!!!! Please keep them coming!!!!! Thank you Pedro! I appreciate it. I went back trough the story again.. Didn’t you miss complete waterproof gloves on this hunt? I guess you had lots of chances of getting your guide gloves wet. My guide gloves did get wet dealing with the river and raft. They did dry fast and I was never too uncomfortable. I am in the development stages of an entire new glove system. More to come on that later. What a great adventure. That country does make a person feel small and insignificant. 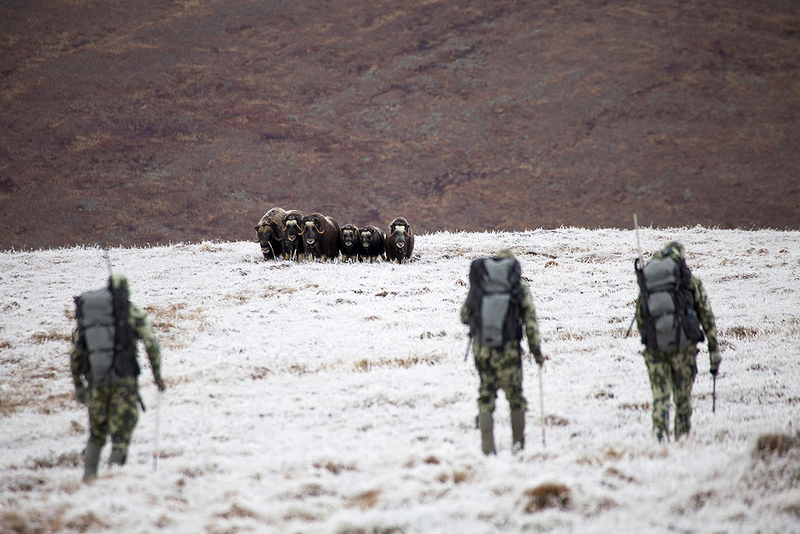 I don’t know how industrialized Adak has become, but caribou hunting on there was a great adventure 8 years ago. Just recieved my gear from you and am looking forward to using it. Great job of geting me glued to the story…nice read…nice photos! Awesome Picture Story! Having just returned back from my first hunt on the tundra and my first hunt with your gear, looking at those pics allowed me to relive my experience as well. 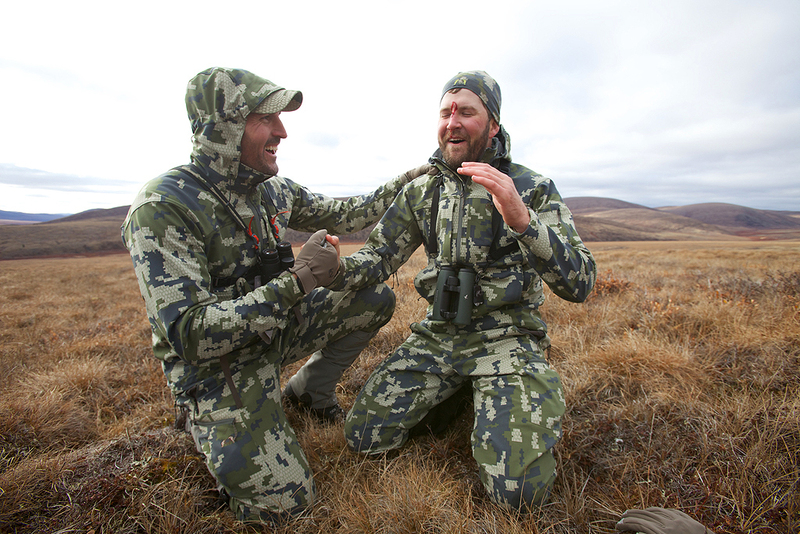 It was great to share in the joy of your hunt. Thanks a bunch. Your welcome Luke. Thank you for taking the time to comment. I really enjoyed your story and the photos are great! Im looking forward to being back in Alaska next summer with the Knonbergers. I really appreciate your commits about Lance and Nikki. Throughout the years, I have been very blessed and fortunate to have hunted and fished with some of the top outfitters and guides in the industry. For me, Freelance rates right up there at the very top with the best of the best. I know you are disappointed that you did not kill a bear but thats why they call it “hunting” and not “shooting”. When we go on a hunt like this and don’t harvest an animal only wets our thirst to pursue them again another day. Keep making the good stuff :). Happy to hear your party was able to get out and take a bear. The weather here in Alaska has been terrible this year. Lots of high winds, rain, and fog. 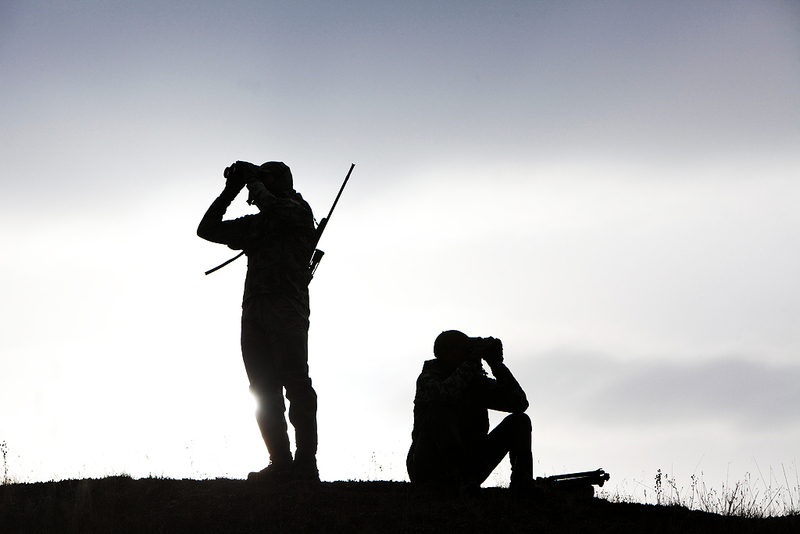 Fast rising rivers left a number of hunting parties stranded and canceled many other’s hunting plans this season. Calling for an early pickup, though dissapointing, was the correct decision. Great pictures! I’m sure you’re already planning your next trip up. Yes, 2014 is booked for the same trip with Lance. I cannot wait. Yep, I respect Mother Nature and many times she wins. Especially that far north. Hi Jason! Thanks for putting together a wonderful pictorial / editorial on this hunt. I was on the phone immediately after receiving the email from Lance and Nikki regarding this hunt but looks like you beat me to it! LOL However, with your words and photos it felt as though I was along for the ride! Good Stuff. Thanks for the comment. Sorry about booking the hunt! This is a prototype that is finalized and moving into production for a late spring 2013 delivery. Now it’s LATE Spring?!? Arghghghgghgh!!! Amazing post Jason the photos and story are stunning. Sorry about not getting a bear but that’s just the way it goes sometimes. Kevin your post regarding the Cessna being built in China was great thanks for the laugh and I agree with Pedro keep going on more hunts I love how you capture the reality of your adventures through great images I visited Paul’s website WOW. Thank you Carl for the comment! I sincerely appreciate you taking the time. I forwarded your comment to Paul. It is fun for him to hear all the compliments coming from his work in our industry. He has really enjoyed capturing the hunting experience. How’d the boots work on on this trip…did you try both? Due to weight restrictions I was only able test the Pamir on this hunt. Best technical mountain boot I have worn. The full shank takes some time to get used to but the advantages in steep mountains are amazing. I LOVE these boots. Nice as always! Thanks for sharing!!! Very nice photo essay. Felt like I was right there. Beautiful country! 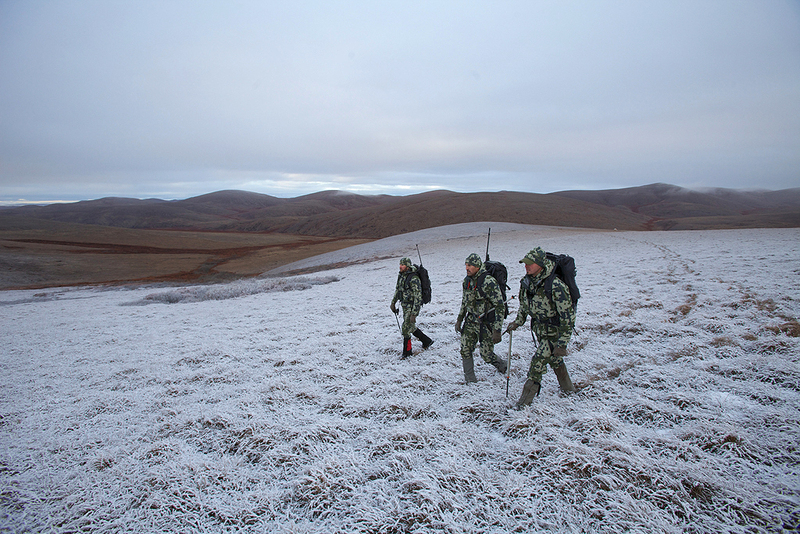 I like that olive Kuiu cap I am seeing in the photos. Where can I get one of those? Send me an email if anyone knows. After the 1st of the year. 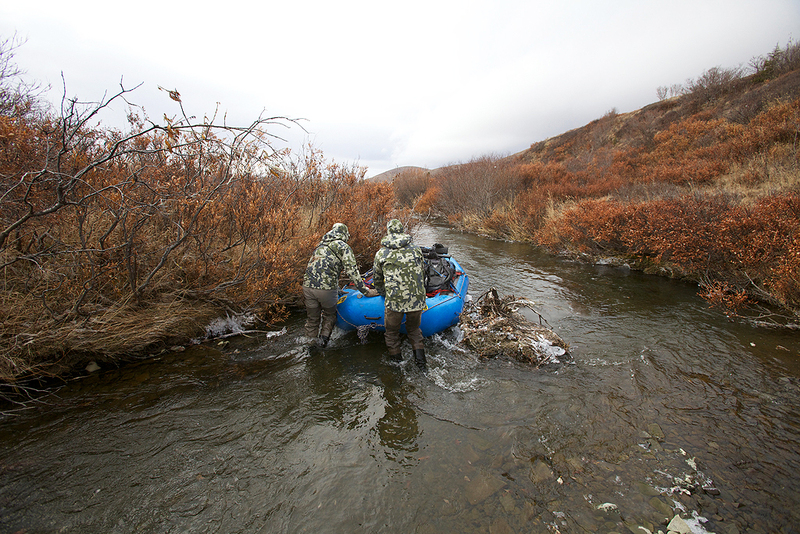 Have you tried the Patagonia Rio Gallegos waders? They have built in neoprene knee pads, great for kneeling in the rivers. No I have not but will check them out. 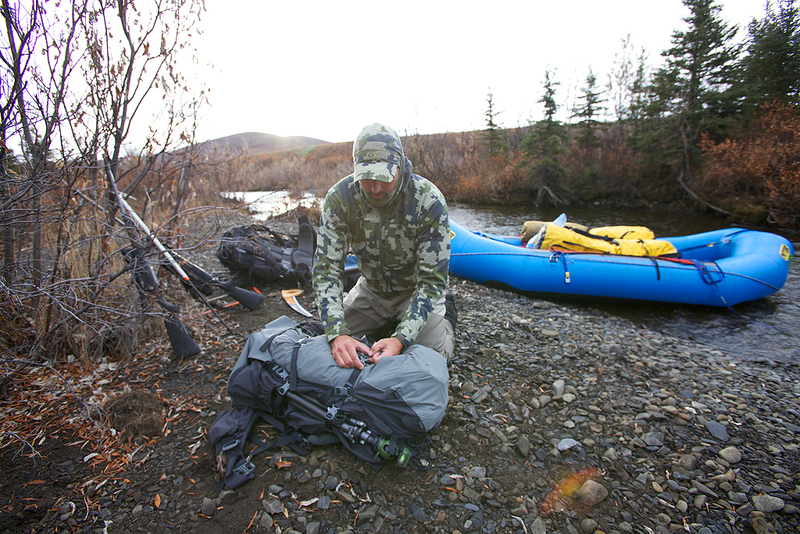 Alaska Time keeps score, still, an amazing experience in the far north! Great photos and story. Completely pulled me away from work for a needed coffee break. California Blacktails will be rutting soon! They are rutting. I was trail running on Tuesday and ran into 3 does and a huge 3×3 chasing them. I am hunting Oregon next month with my longbow. The late hunt in Oregon can be a blast. You going to be in the NW or SW part of the state? Sweet photos and story…what a great trip. Awesome write up! My only complaints that I now have to wait for that hat, new insulation layer and the bino harness! How are you liking the verde vs the visa? I’m still a fan of the vias. I love the Verde because it is the newest and latest. Fantastic! looks like a great trip. I’ve got to ask Jason, what camera & lens are you using??? you photo’s are unreal! All the photos are shot by Paul Bride who is the most accomplished Outdoor Photographer in the world. It is not the camera or lens. It is 100% Paul. He shoots Cannon. NICE Jason. 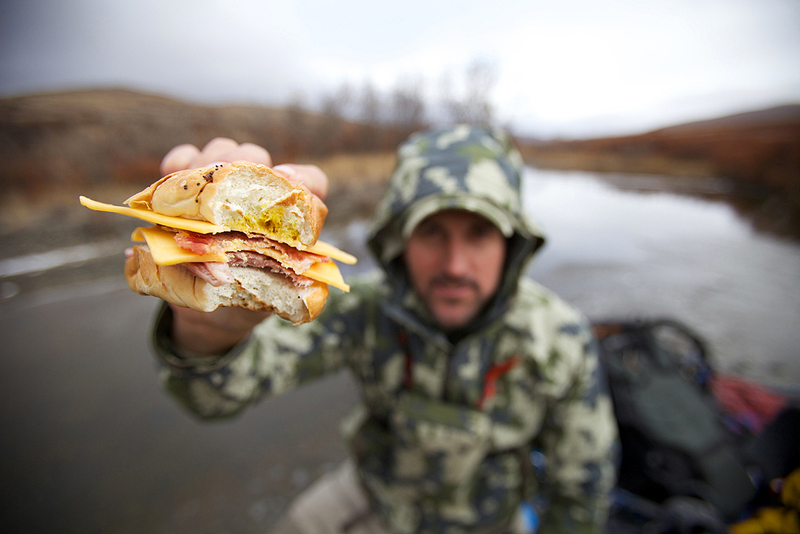 Looks like you were near the Yukon River. I didn’t realize there were musk ox down that close to the river? Awesome trip. Thanks for sharing the pix and the writeup. We were South of the Yukon as far as I know. ? Great looking adventure and some amazing country and stories. Wanted to ask about the blood on Lance’s pants in one of the photos. Not knowing if the photo sequence is right but he has it on them and then it is gone later in the photos. What did he do to get rid of most of it in the field? River or other method? Just asking if it happens to me? Also I may need to sell my C185 since they are heading over seas!! LOL thanks again for sharing your info on your hunts and great product and testing!! will be looking for the boots soon. He wore the Guide Pants which did not have blood on them. His Chugach Pants had blood on them from DJ’s bear. Jason, thanks for sharing…I was totally on the edge of my seat throughout. In 2014, you ought to hunt those big bears with your stick bow. Now that would be a story…Saxton Pope style. LOL. Love the Verde. I didn’t think there was anything close to VIAS, but the Verde looks amazing. Looking forward to your next KUIU hunting adventure. Thanks man. I am not sure I am tough enough to hunt them with a longbow. My wife is certainly against it! Verde is awesome! Thanks for the comment. Congrats on your bull! Nice work! Thanks Ale! I really appreciate it. I see no flaps over the pockets of the new guide pants, was that a change in the production run? Love the flaps, please keep them. A very nice exposition of a trip of a lifetime for most people. I do not know where that guy came out with a Cessna made in China thing! The Cessna 180 was made in Witchita Kansas from 1951 till 1981 and the city is called the air capitol of the world. NOT CHINA! 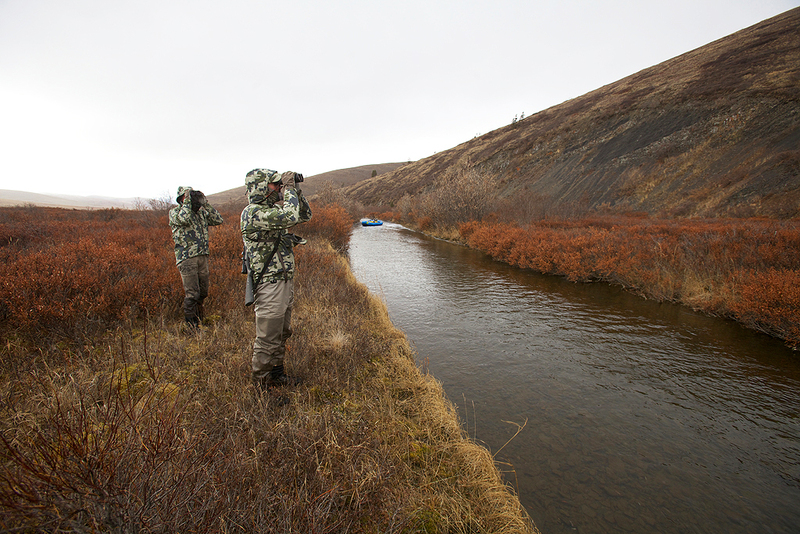 regarding your hunt is there a reason you chose a chest wader vs a hip wader? 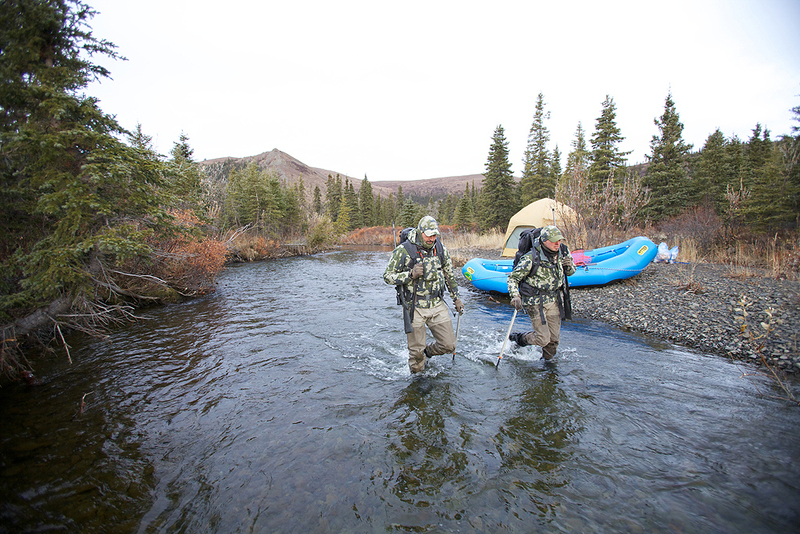 I am going to Alaska next year on a Moose hunt ( drop camp ) and with the weight restrictions flying in I think a pair of fishing waders with boots to match will be lighter and be more usable if you happen to be in deeper water. Hip boots weigh in at about 7 lbs and limited as to where you can go. Nice trip and post… cannot wait until next year and hear the end of that trip. Bob. Hahaha, you are 100% correct Bob. I was making light of Jason’s recent announcement and some people’s reaction to it. Although there is a facility in china, it is for a much different plane than the 185 Lance used. We were in water deeper than hip boots. I personally like the Simms waders better than hip boots because they are easier to hike in an pack down smaller and are lighter as you mention than hip boots because they do not have built in boots. Call me if you have any questions or I can help in your planning. Great story and pictures. Thanks for sharing! It was an amazing adventure! Mother Nature just did her thing. Part of hunting in the north! 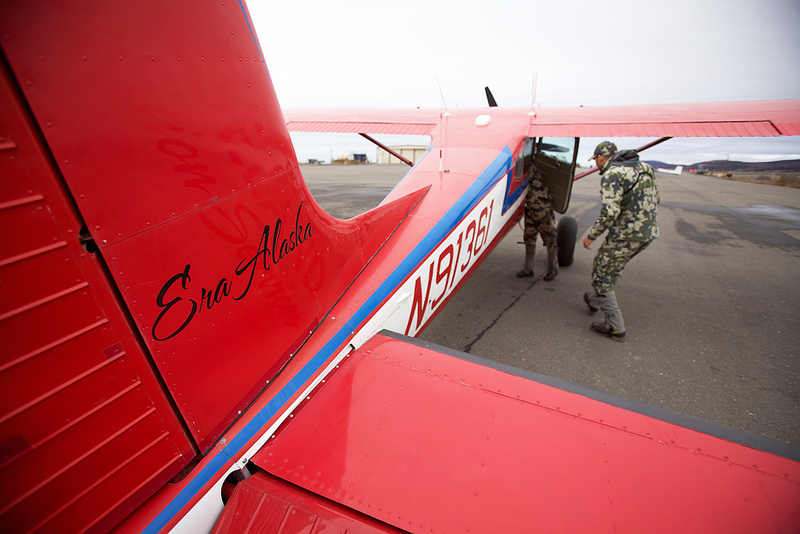 i to just returned from a grizzly, moose, bou, and wolf hunt from kotzebue alaksa. 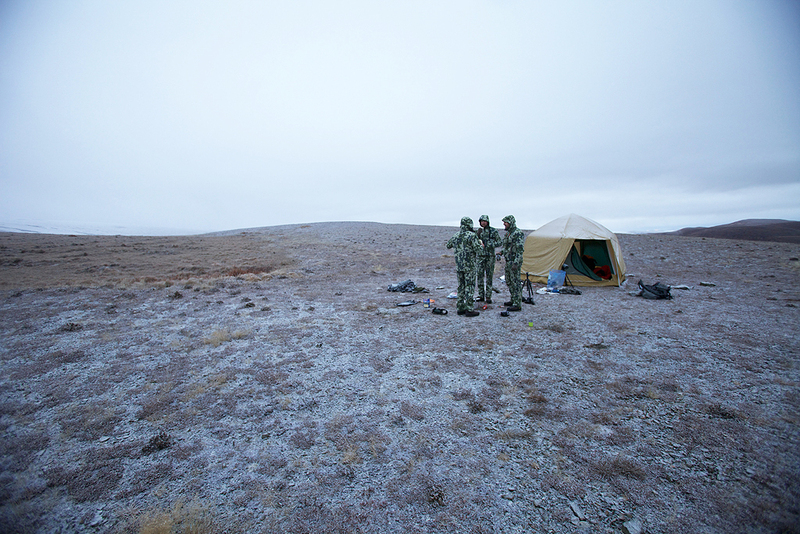 it was COLD where i was and i found that my kuiu clothing was not enough to keep me warm while glassing. i was wearing the 250 MW base layer, the guide pant, the spindrift jacket, the guide jacket with the vest on top, and the chugach top/bottom for buck the cold wind. 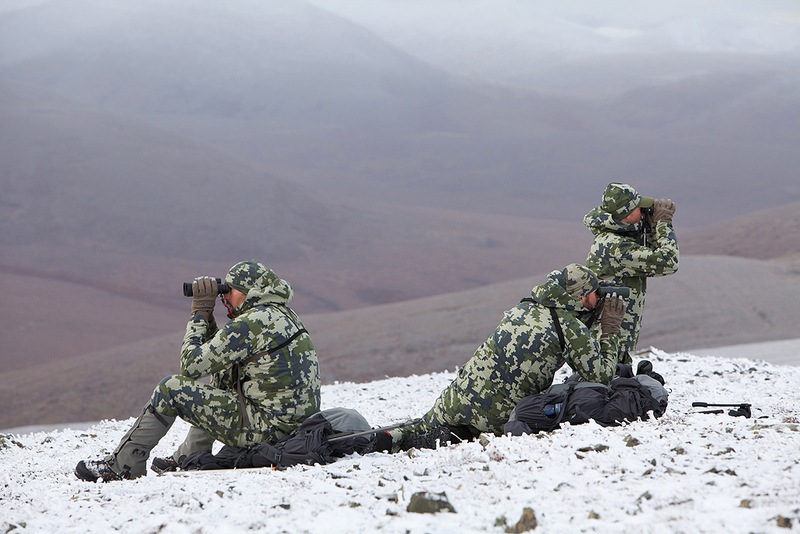 do you have plans of making a heavier primaloft or similar material bottom and top for cold weather hunting. also a heavier cap. otherwise put the gear through the ringer. i now have a brown bear hunt, two dall sheep hunts, and two moose hunts down with your clothing and it all worked as planned i just found i needed to add some warmer layers to it this last hunt. oh ya, warmer/heavier gloves for glassing cold weather. thanks. All of these items are coming very soon. 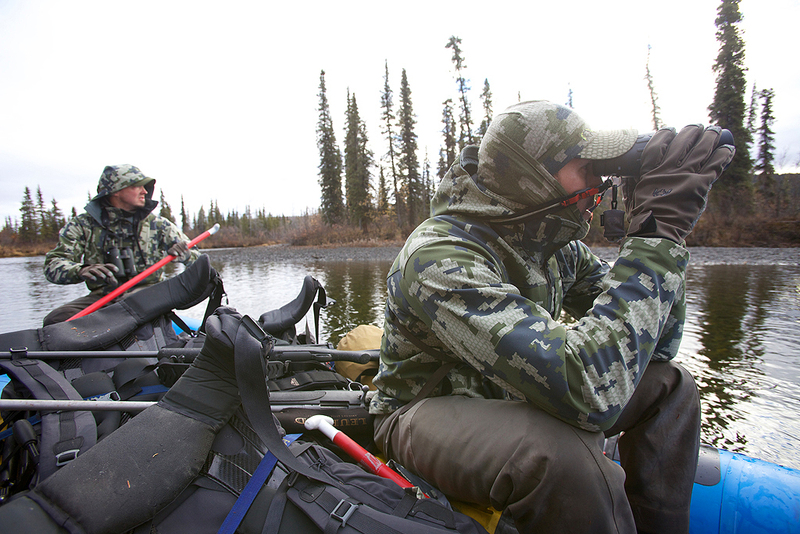 Jason, just curious what power binos you guys were using out in the open north country? Thanks. I was using Zeiss 10X50’s. Let me know if you have any other questions. 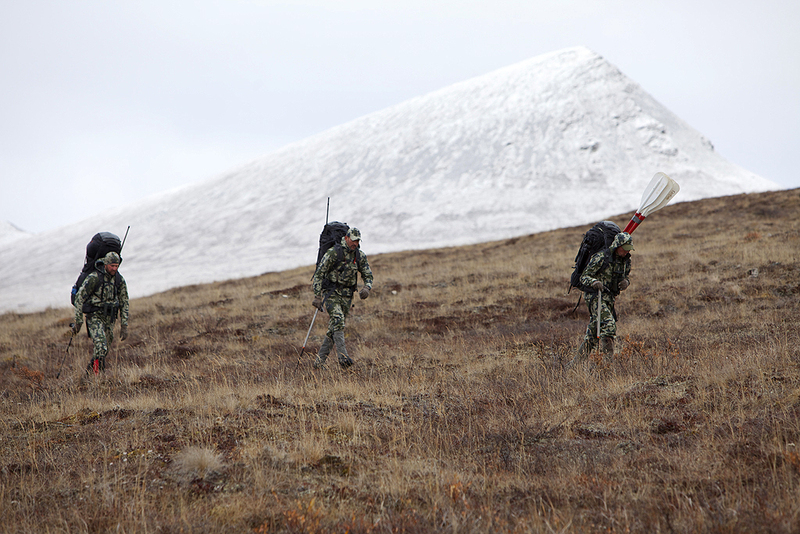 great hunting trip report illustrating the challenges of N. Alaska. Thanks for sharing this! Looks like you are using the Swarovski spotter in one shot – awesome spotter with a bit more color correction than the zeiss – I hope they build a range finder in at some point. Yes, this was Lances spotter. I use a Zeiss Diascope and love it. Great story Jason. Bummer on no bear, but time in Alaska is always rewarding. Look forward to hearing more about the new insulating products. Thanks Matt. Tomorrow there will be the 1st announcement on the new insulations. Looks like a great hunt. One of the things on my bucket list. 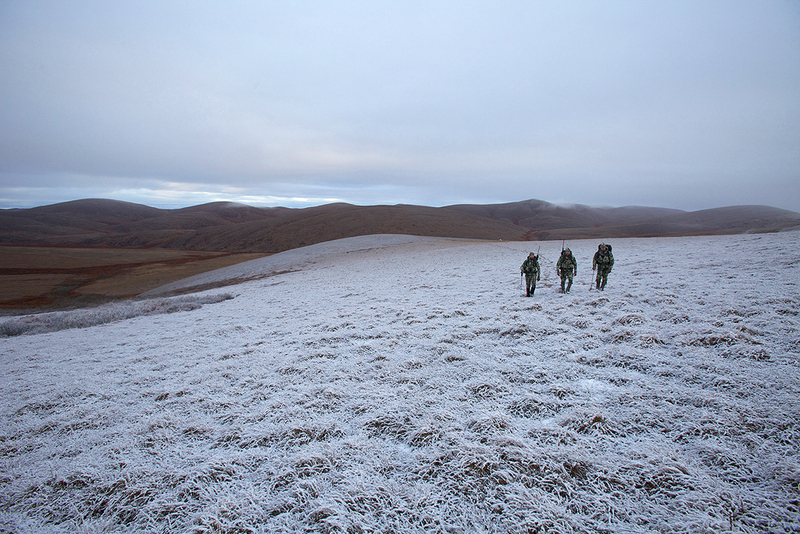 I just returned from a successful Elk hunt where we dealt with rain, sleet and snow. My Kuiu gear performed flawlessly. Thank you so much for a great product. Thanks Matt! So glad to hear the product performed as promised for you. Absolutely love the picture story, you should consider making short vids with stills and video. I know he works for Sitka but Seacat creative does some amazing little clips, if those things don’t make you wanna go hunting nothing will. Glad that you are so humble about not getting your bear, its a lot more real world than just showing all successful trips. If was easy, it would be called shopping. Hi Brad, I know Mark pretty well and agree he does some fantastic video work. I have eaten more tags than anyone I know over the years. Thanks for taking the time to comment.